Walks which pass a shipwreck which is exposed at low water. Note that in many cases this may only be visible depending on the state of the tide, levels of sand etc. The majority of the coastal walks also have stories of the undersea wrecks along the coastal stretch of the route. A circular walk along the coast from Polzeath past a number of small coves to the vast sandy beach at Daymer Bay, returning through the dunes past St Enodoc Church which was once so deeply buried in the sand that entrance for services was through the roof. Remnants of ships wrecked on the Doom Bar are strewn over the rocks at Trebetherick Point. A circular walk on the rugged cliffs at the most westerly point of the British mainland with spectacular views and spectacular wildflowers. The wreck of the RMS Mulheim is visible from the Coast Path. A circular walk around the thriving town of Falmouth which didn't exist until Elizabethan times when Sir Walter Raleigh suggested that the largest natural harbour in Europe would be a good place to build a port town. The remains of a German U-boat and fragments of five others can be seen at low tide on Castle Beach. A circular walk across the dunes and headland between Rock and Polzeath returning via St Enodoc Church where Sir John Betjeman is buried. Remnants of ships wrecked on the Doom Bar are strewn over the rocks at Trebetherick Point. A circular walk around the rugged coastline of Trevose Head via the iconic lighthouse and golden sandy bays of Constantine, Booby's, Mother Ivey's and Harlyn, with spectacular wildflowers in spring and summer. The wreck of the SV Carl is visible on Booby's Bay to varying degrees at low tide depending on the level of sand. A one-way coastal walk, made circular via an initial bus journey, along the Seven Bays coast and around Trevose Head past the lighthouse. The wreck of the SV Carl is visible on Booby's Bay to varying degrees at low tide depending on the level of sand. A circular walk from St Ives through the Steeple Woods nature reserve to the monument overlooking St Ives Bay where the eccentric quinquennial ceremony of John Knill has been performed for over 200 years, returning along the coast via the white sandy beaches of Carbis Bay and Porthminster. The wreck of the SS Vulture protrudes from the sand at Carbis Bay at low tide. A one-way walk to St Ives along the beaches from Lelant including the vast expanse of Porthkidney Sands, Carbis Bay and Porthminster Beach, returning on the coastal railway. The wreck of the SS Vulture protrudes from the sand at Carbis Bay at low tide. A circular walk along the Victorian Excursion route from Lizard village to the most southerly point and along the coast path to Kynance Cove with spectacular views, wildflowers, and wildlife including the Cornish Chough. The wreck of the SS Maud is visible at low tide on Pentreath beach. A figure-of-eight walk from Readymoney Cove past the Tudor fort and along the coast where Daphne Du Maurier lived to Polridmouth where the shipwreck inspired the end of her book Rebecca, and then along the mediaeval streets of Fowey. At low tide the wreck of the Romanie is visible at Polridmouth Bay, and a large gear wheel from the Kanteong dredger protrudes from the sea beside the coast path. A circular walk from Holywell Bay past the remarkable sacred spring and along the coast to the sandy beaches of Porth Joke and Crantock, returning via the poppy fields of West Pentire and the Cubert Common nature conservation area. The remains of a ship is visible protruding from the sand at low tide, thought to be the SS Francia. A circular walk from Lelant following St Michael's Way along the vast stretch of beach from Porthkidney Sands to Carbis Bay, with views over St Ives Bay on the return route. The wreck of the SS Vulture protrudes from the sand at Carbis Bay at low tide. A circular walk from the white sandy beach at Sennen Cove along the towering granite cliffs via Land's End to the song of the sea cave at Nanjizal. The best way to see Land's End. The wreck of the RMS Mulheim is visible from the Coast Path. A circular walk from Holywell Bay along the rugged coastline to Perran Beach and across the dunes to the Dark Ages relics of St Piran's Oratory, Church and Cross, returning via the Penhale Sands nature reserve which is carpeted in cowslips during spring. 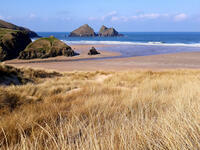 The remains of a ship is visible protruding from the sand at Holywell Bay at low tide, thought to be the SS Francia. A circular walk from Crackington Haven, with panoramic views of the Shipwreck Coast, to the long, sandy Strangles beach, returning through bluebell woodland along the Ludon river valley. The engines from a German WW2 high-speed torpedo boat can be seen on the beach at Tremoutha Haven at low tide. A circular walk near Fowey from the tiny harbour of Polkerris, past the daymark tower on Gribbin Head and along the coast where Daphne Du Maurier lived and based many of her books on, to the sandy beach at Readymoney Cove, returning on the Saint's Way. The wreck of the Romanie, which inspired Daphne Du Maurier's murder scene in "Rebecca", is visible at low tide. A one-way coastal walk, made circular via an initial bus journey, along the Shipwreck Coast from Crackington Haven to Boscastle passing the largest seal colony in North Cornwall, the highest cliff in Cornwall and the long, sandy beach at The Strangles. The engines from a German WW2 high-speed torpedo boat can be seen on the beach at Tremoutha Haven at low tide.